For a moist and flavorful salmon entrée that is parve and can be eaten with a meat or dairy meal, simply drip seasonings on the fish, wrap the fillet tightly in foil, and bake. 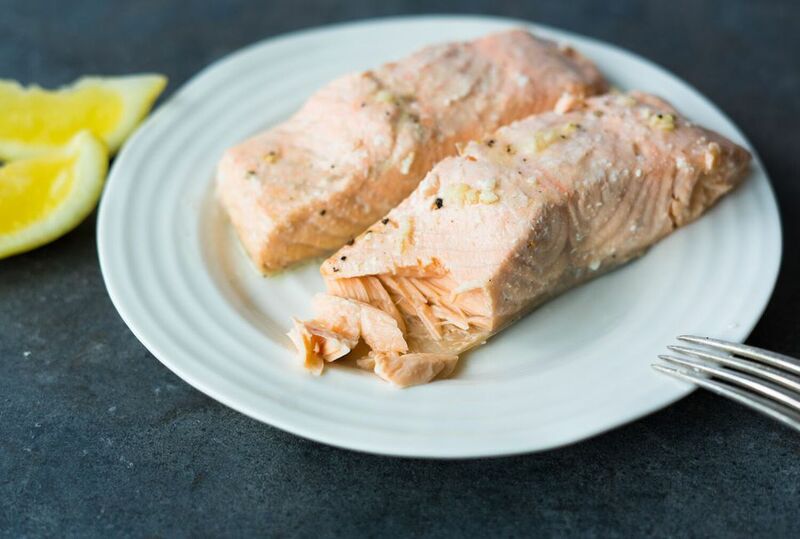 This six-ingredient recipe is easy to make, healthy and light to eat, and aesthetically pleasing enough to serve to guests—especially when you're looking for delicious kosher salmon recipes to make. Clean, rinse, and pat dry the fillet. Place salmon fillet—skin side down—on a piece of aluminum foil that is large enough to wrap around the whole fillet. Then place on a baking sheet or in a shallow pan. In a small bowl, mix together the lemon juice, oil, garlic, salt, and pepper. Pour the seasonings over the fillet. Then wrap the foil around the fish. Seal edges well, but leave room for the fish to expand. Bake the fish for 10 minutes for the heat to penetrate the foil. Then cook another 10 minutes for each inch of fish thickness. The salmon is done when it flakes easily when tested with a fork. When done, remove from oven, unwrap, and discard salmon skin. Salmon bought fresh from a fish store is generally much better than salmon bought from the grocery store frozen section.